In a quaint colourful town, the force of nature is causing a curious occurrence: a typhoon is blowing bank notes all over the city! Aspect Gaming is bringing you a vibrant slot with entertaining animations, features, fun gameplay, and a unique theme that you’re sure to enjoy. Typhoon Cash is played on five reels, four rows, and a total of 50 fixed paylines. In Typhoon Cash, you’ll be braving the strong winds to win some prizes: match at least three symbols on a payline to win a prize. In Typhoon Cash, you’ll also encounter wilds, scatters, and a free games feature with sticky wilds. On the reels, you’ll see several symbols related to the weather: black clouds, umbrellas, sonars, satellite dishes and wind socks. There are also six playing card symbols which represent the low paying symbols. The typhoon symbol is the wild in the game which can appear on reels two to five. This substitutes for all symbols except for the scatter symbol which is represented by a red alarm. Three scatters landing anywhere on reels one to three will trigger 10 free spins plus a prize of 3x your total bet! During the free spins, the three alarm scatters that appear will award five extra free spins. If you get another three scatters, they won’t trigger extra free spins (you can win a maximum of 15 free spins) but you do win another scatter prize of 4x your bet. Even better, all typhoon wilds appearing in the free spins will stick into place for the remainder of the free spins! In Typhoon Cash, you need to match between three to five symbols on a payline to win a prize, although some symbols pay for just two matching symbols as well. These are the sonar, the black cloud, the satellite dish, and the pink umbrella. The sonar is the highest paying symbol, worth 0.2x your bet for two symbols, 0.6x for three, and 4x your bet for a hit of five. The black cloud and the satellite dish then pay between 0.2x and 3x your stake, whilst the pink umbrella pays between 0.08x and 3x your stake. The wind socks and the playing card symbols pay for three to five matching symbols on a line. The wind socks pay between 0.4x and 3x your stake, whilst the playing card symbols all pay up to 2x your bet. 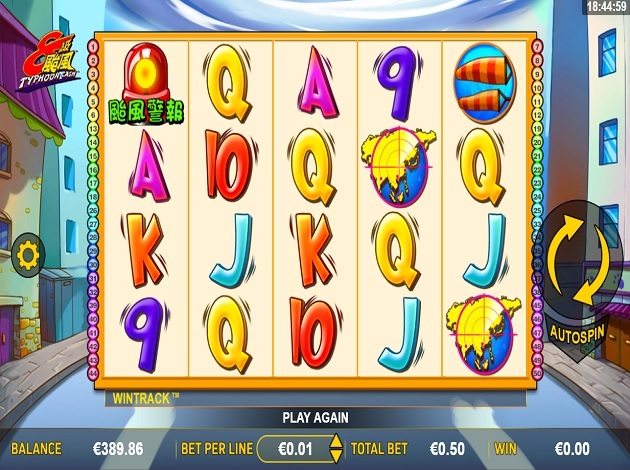 Typhoon Cash is a very cheerful slot to play despite the typhoon taking place! The colours are bright and vibrant, whilst the symbols are cartoonish in design. The artwork resembles a comic strip to some degree, giving Typhoon Cash a very intriguing look. The symbols are related to the theme, with the exception of the standard playing card symbols, creating the right atmosphere in the game. Behind the reels, you can see the deserted streets where people seem to have fled to safety as the typhoon approaches. Typhoon Cash is a unique slot inspired by the terrifying forces of nature, except in this slot, bad weather could potentially mean good prizes for you! The design is crisp and attractive, the free spins with sticky wilds make things more interesting and overall, Typhoon Cash is a very entertaining slot to play. Grab your umbrella and head to Typhoon Cash at Videoslots today!